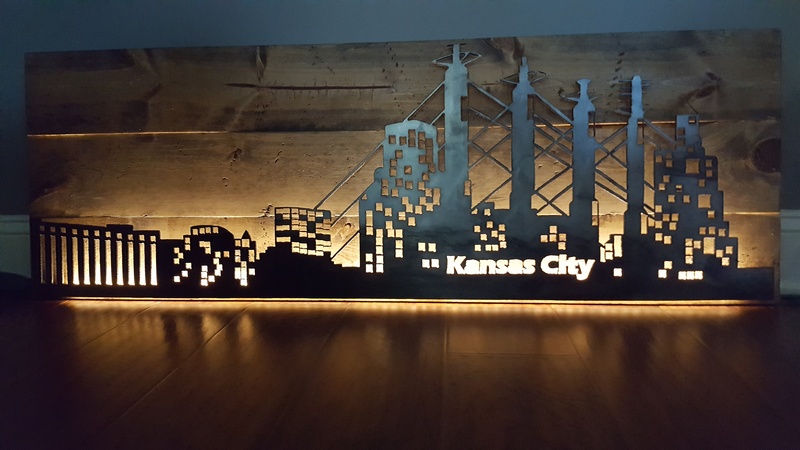 ​The Kansas City Skyline is cut from 1/8" plate (11 gauge steel) and measures 46" in length. It is mounted to a 48" X 16.5" distressed wood backing. The cityscape features LED backlighting which is controlled by an On / Off / Dimmer touch pad. The lights plug into a standard household 110 volt outlet or may be hardwired to conceal the power cord. INDOOR USE ONLY. The KC Skyline is ready to ship or arrangements for local pickup in the KC area may also be made. ​Lighted Kansas City Sky Line, cut from 1/8" plate. ​Back side with the power supply, power cord and touch controller. It does have a dimming feature.